No matter how early you awaken, Ganga and her people are already at work. They never stopped, really. Corpses have been burning all night. The tourist boats may be idle at 2 AM, but some of the boatmen are making repairs at that hour. 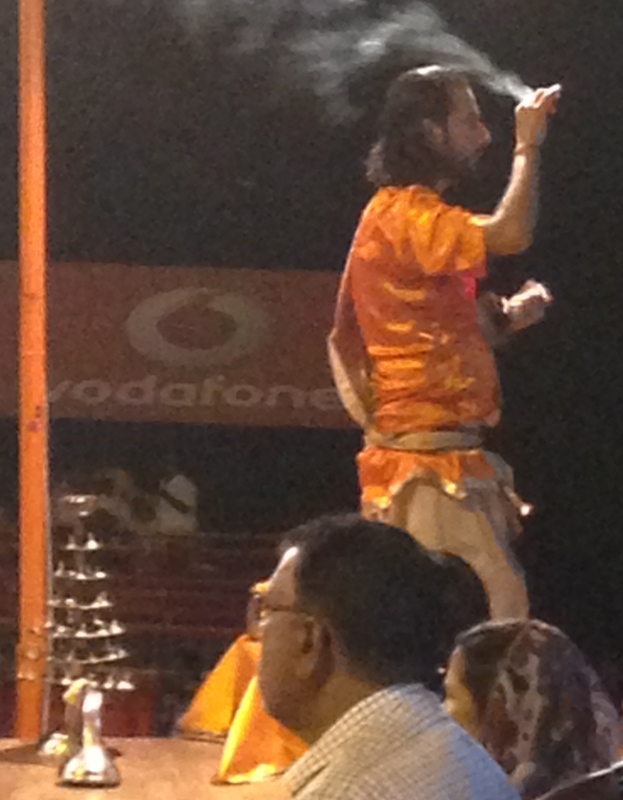 A Hindu priest performs puja at Dashashwamedh Ghat on the banks of the Ganges. Nightfall does not end religious activity in Varanasi. And the river itself has been working, too. It has carried away the ashes of many a person. It has given water generously to the tanks and pipes of Varanasi. It has accepted all the sewage and detritus that humans have thrust into its arms. It has fed the fish that swim just beneath its cloudy surface. Yes, you may awaken before sunrise, and you may even walk upon the Ghats before the sun has shown the tiniest sliver above the horizon, but the Ganga and her people are there before you. The river has carried another million, million gallons into view and the boatmen are on the Ghats ahead of you. Every day for years and years they have been waiting for you. Bathers are there ahead of you, too. Some are devout Varanasi regulars, votaries, who immerse themselves every day before they begin their work: rickshaw men, booksellers, homemakers, deep-fry cooks, and, surely, even some crooks. Ganga accepts them all, gives them a taste of purity. Some are pilgrims who have traveled across India to be here, to fold themselves in Ganga’s dark, oily arms. They may have been waiting a lifetime for this moment, and none of your sleepy-eyed stumbling will distract them from this sacrament: being with the river as the sun rises, the first bath in a day of baths. Panch-tirtha yatra: purification after purification after purification, until they have washed themselves at each of five specific and holy Ghats. You may awaken before sunrise, you may be at the Ghats in the first blush, you may even be sitting in the stern of a small rowboat, but Ganga and her people have been here so long before you, doing what they must, doing what seems destined. 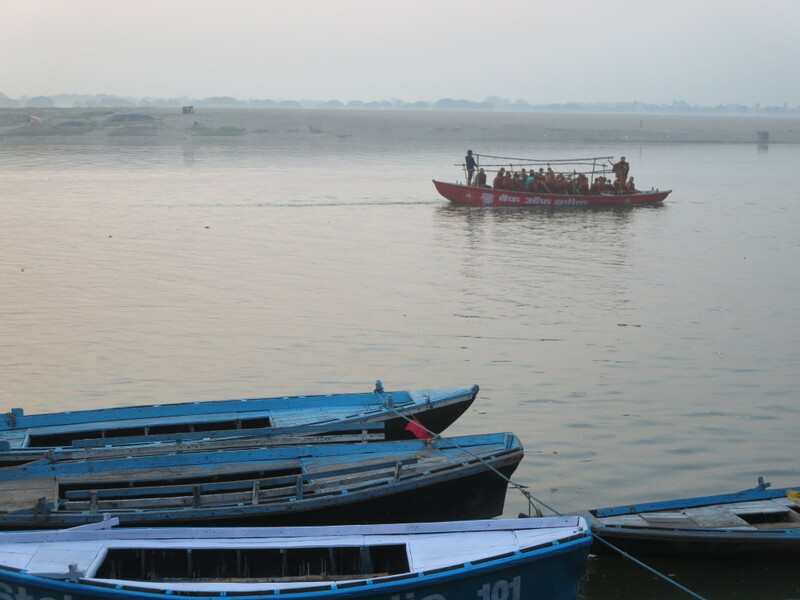 Three boats, with old motors popping, are coming slowly up river from the direction of Sarnath. Each carries a load of forty Buddhist monks swathed in saffron robes. Ganga carries them here—From Taiwan? From Sri Lanka? Ganga doesn’t care—to experience something older than Buddhism. And you also, you will soon experience something older than Buddhism. A boatload of Buddhist monks who’ve come to visit holy sites in the Buddha’s life also treat themselves to a tourist’s view of Hindu spiritual life. The ancient city—it’s had so many names over the centuries, Varanasi, Benares, Kashi…it’s almost tired of having names—is built to the west of Ganga. Tufts of grass grow on the eastern shore when the season is right. Trees grow in the distance. Ganga and her people have been working for thousands of years in this place, eons before you awoke this morning, but they have never built a structure on the east bank. That would block the dawn, the sanctified sunrise. You must turn away from the ancient city to see the dawn. The air is heavy near Ganga. Her haze softens the Indian sun. So soft is this sunrise that a gentle violet light is on everything and the first red sliver of its face seems to rise not at the horizon, but mysteriously above the horizon. The sun grows as you watch, from sliver to segment, from segment to semicircle. The air is so heavy with Ganga’s moisture that you need not shade your eyes. It is a soft, embracing red. The semicircle hovers, lifts, becomes a perfect disk. After the disk is full—How long did this take? 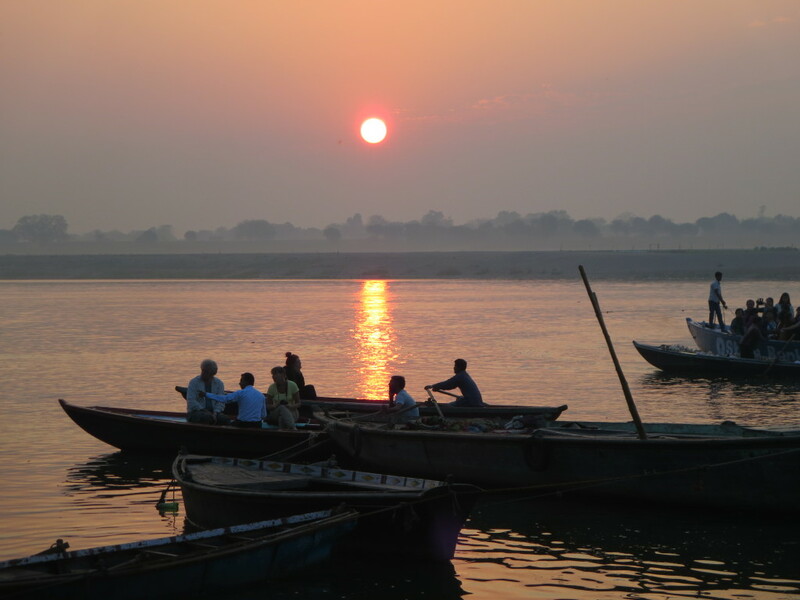 Eternities mean nothing to Ganga and Surya—there is some trick of the air, some shimmer caused by Ganga herself. Your cheeks feel the heat of the Indian sun. The dawn is tactile now. And the disk is orange, though you cannot say when it stopped being that cherished red. Soon you must look away. By the time the sun turns orange, the boats are in full swing and the Ghats of Varansi are humming with activity. The sun will soon turn hard and hot and yellow. Soon you will turn your gaze back toward the ancient city, to the stones of its very foundation, to Ganga’s people. First lower your eyes to her water, and watch the reflection of that orange sun creep higher. Watch it through Ganga’s ripples and currents. Let her murk and her flow prolong this holy moment. 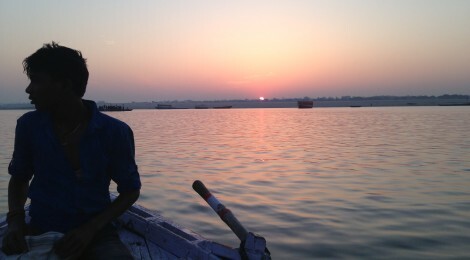 The moment before you return to the world of Ganga’s people, who labor on the stones, and bathe in her mysterious water. 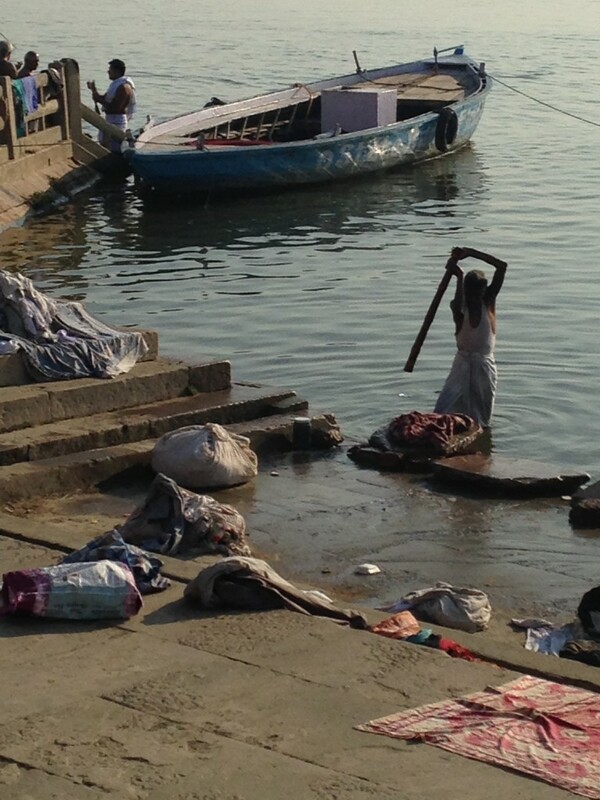 A dhobie wallah clubs a sheet on a laundry rock at the edge of the Ganges. Several Ghats are dedicated to the purpose of laundry.